Traditionally, summer camp comes to a rousing finale with the gymkhana. As well as being great fun, gymkhana is excellent training for your horse, as it encourages him to be balanced, supple and forward-going. We split into three teams, and practised the half-dozen games on the Saturday afternoon. Many riders and most horses had never done any gymkhana, but everyone entered into the spirit of it, getting increasing competitive as the games wore on. Unfortunately, a couple of…ahem…minor incidents on Sunday morning left Lisa and Pam’s nerves so frazzled that they wouldn’t let us gallop in the actual competition on Sunday afternoon! In protest, we called our team the ‘New Barn Ambulance Dodgers’. The other, less fate-tempting team names were The Mouseketeers and The New Barn Nutters. 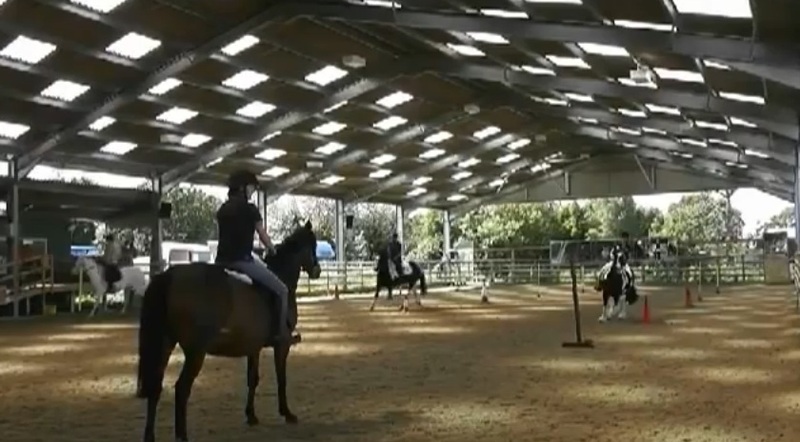 Gymkhana expert Danielle Dawson was seconded to judge the event and give us some tips. The competition started with the simplest race, the bending. Three rows of ‘bending poles’ – in our case, purpose-made plastic posts, but you could use improvise with traffic cones or sturdy canes – were set up, with the poles several feet apart. The first three horses, one from each team, lined up to wait for the start signal. On the word ‘go’, the object was to trot up the row, passing to the left of the first pole and the right of the second, etc. At the end of the row, we circled the final pole before bending back down the row in the opposite direction. 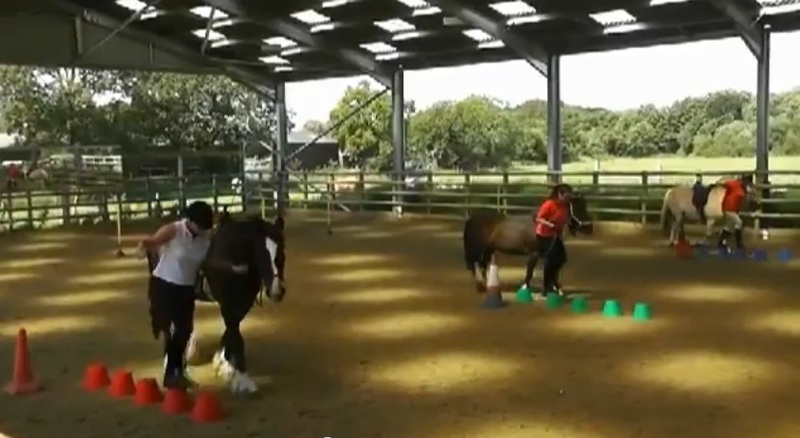 As each horse passed a pre-designated point, the next horse in the team was allowed to start. The trick with this race was not to let the horses go too fast, as they risked missing the poles out, and also overshooting at the end instead of doing a small, tight, time-saving circle. Many horses proved unexpectedly brilliant at this, including Roxy the Shire cross, who was quicker and more agile than many of the smaller ponies. Blue and I wait for our turn to start in the bending race. Next up was the stepping stones race. This one involved riding up to the top end of the arena, passing round a marker post, riding back to the row of stepping stones (upturned flowerpots) and dismounting. The rider then walked on the stepping stones while leading the horse. This race looked deceptively simple, and many horses took exception to the stones or refused to stand still to let their riders dismount. This was one race where those on the smaller mounts definitely had an advantage. Liz and Roxy (left), Marie and Polly (middle) and Mel and Joss show off their footwork. Tips for this race included riding right up to the stepping stones instead of getting off too early and having to leader further, and getting off on the wrong side to save time – although this caused more trouble than it saved! The third race of the day was the relay. 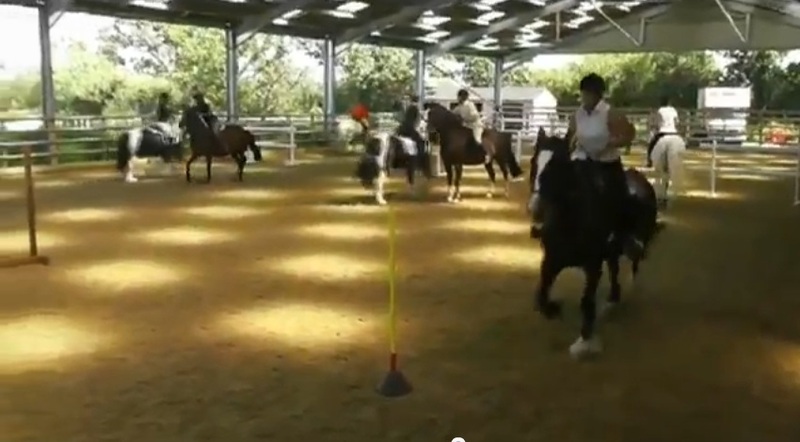 Each team member rode in turn to the top of the arena, turned round the marker post and rode back before passing over the sturdy plastic baton to the next rider. As many of the horses were evenly matching in speed and agility, the trick here was to make the handover as smooth as possible. The fastest way to hand over was to do it on the move, both horses trotting towards each other with each rider leaning forwards, hands outstretched. The downside of attempting a fast handover was the chance of dropping the baton, and having to dismount to retrieve it! Riders attempt a moving handover in the relay race. For this race, the first two riders in the team each carried an item – an egg box or a string of ‘sausages’ (no pigs were harmed in the making of this gymkhana game!) – in turn to the top of the arena. The rider then dropped the object into a waiting basket before hurrying back. The final member of the team rode to the basket, dismounted, loaded a shopping bag with the objects, and led back as quickly as possible. The main challenge here was riding a tight, accurate circle with hands full of egg boxes, and also the risk of dropping the object through an inaccurate throw. The highlight of the event was definitely the apple bobbing. We hadn’t practised this on the previous day, so none of us knew quite what to expect! The first riders rode to the top of the arena and dismounted, handing their reins over to the waiting helpers. Each rider then found a large bucket half-full of water, with several floating apples. We quickly discovered that the only way to get the apples out was to get soaking wet! After retrieving an apple, we lead our horses back to the start, being far too wet to put our hats back on. 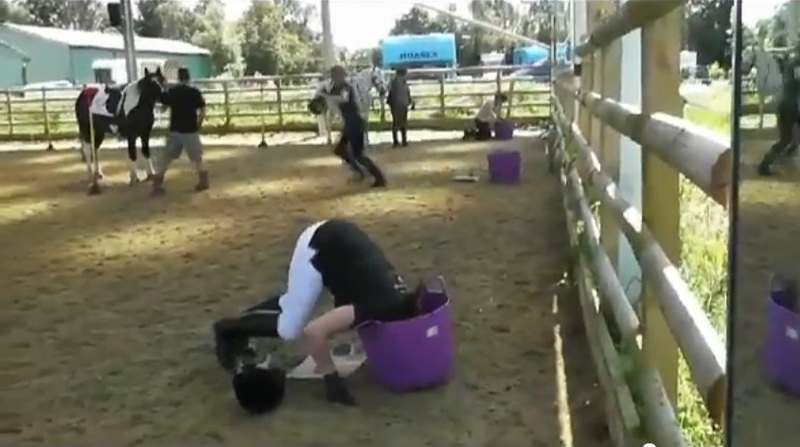 Despite being a gymkhana novice, Claire demonstrated a textbook Prince-Philip-Cup-style retrieve, diving head-first into the bucket, pinning the apple against the bottom and surfacing triumphantly, all in a couple of seconds. Claire demonstrates her winning style. Claire’s breathtaking performance led to our team – the Ambulance Dodgers – winning the gymkhana games overall, and ensuring a fantastic end to another Summer Camp.